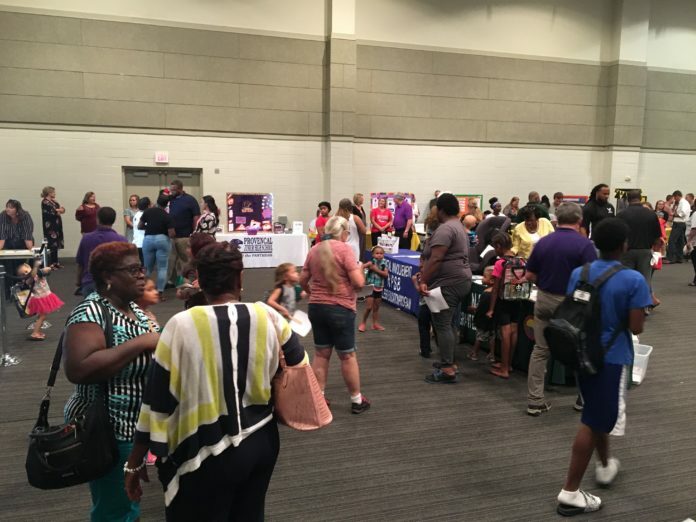 Each parish school, along with community organizations, were there to answer questions and outline what they will have available for students throughout the school year. Information on transportation, school supply lists, acceptable uniforms, after school programs and more was also available. The first 300 student attendees received a backpack filled with school supplies. From left are Provencal staff Vanessa Birdwell and Tammy Graves with Principal Mary Yount. Several schools have scheduled open houses before school starts Monday, Aug. 13. •East Natchitoches School will have registration Aug. 6-7 from 8 a.m.-2 p.m. Parents and guardians are asked to take the child’s birth certificate, Social Security card, proof of residency and current immunization record. The school will host its open house Thursday, Aug. 9 at 6 p.m. For more information, contact East Natchitoches Elementary at (318) 352-4516. •Provencal Elementary/Jr. High will hold open house Thursday, Aug. 9 at 6 p.m.
•L.P. Vaughn Pre-K-K Learning Center open house will be at 6 p.m. Tuesday, Aug. 7. •L.P. Vaughn 1st -2nd Grade Learning Center open house will be at 5 p.m. Sunday, Aug. 5. •M.R. Weaver Elementary open house will be a 6 p.m. Monday, Aug. 6. •East Natchitoches Elementary open house will be at 6 p.m. Thursday, Aug. 9. •Marthaville Elementary/Jr. High will have open house at 5 p.m. Thursday, Aug 9. •Fairview Alpha Elementary will have open house at 5:30 p.m. Monday, Aug. 13. Parents, teachers and students took the opportunity to get acquainted. Staffing is a year-round job at the Natchitoches Parish School Board for Director of Personnel Linda Page. There are several changes in administrative personnel for the approaching year that result in the reorganization and banding of grades. Page says that the principal at Goldonna, Frederick Dickinson, is new to the district. Natalie Ducote was a teacher last year and is now principal at L.P. Vaughn. Carissa Davis, Alyson Erikson, Akilah Issac, Cori Beth Manuel and Dylan Solice were teachers last year and are now assistant principals. Chrystal Davis and Jennifer Martin were assistant principals last year and are now principals. Davis will be at East Natchitoches and Martin will be at Weaver. Dennis Breland and Marsha Daugherty were discipline coordinators and are now assistant principals. The following are the schools, grades at those schools, principals, coordinators/assistant principals and secretaries. Goldonna Principal Frederick Dickinson is new to the school system. The Marthaville booth was manned by, on front row from left, Lexie Trichel and William Jones. On back row are Alana Jones and Hunter Laurent. Principal is Micah Nicholson. Everyone was asked to register upon arrival. Previous articleTwins Day edition – over 70 sets of twins featured – On news stands Wednesday afternoon!